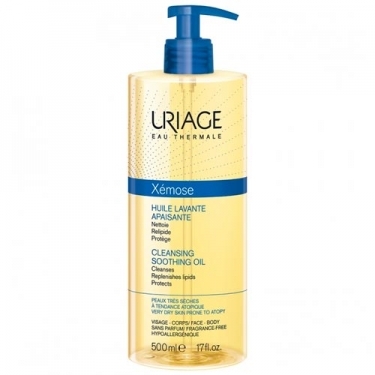 DESCRIPTION: Xémose Huile Lavante Apaisante from Uriage is a cleansing oil that protects against the drying effect of water and relieves itching. Its fine, ultra-soft foam provides immediate and long-lasting comfort for dry to very dry skin. Thanks to its high concentration of glycerine, Xmas Cleansing Oil leaves a non-oily protective film that protects the skin from external aggressions. Enriched with Shea butter, it appeases the skin, reduces the pruritus, the sensation of pulling and the discomfort. Hypoallergenic. Without perfume. No soap.